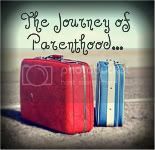 www.journeyofparenthood.com. Emily has been a long-time blog reader here. Emily is a Babywise mom. She is very open and very bubbly. She is a positive person who is very friendly. She shares all about her life and adventures on her blog. She is sweet and strong at the same time. Go on over and check out her post and her blog. I am sure you will love getting to know Emily. I am already a follower of babywisemom and tell everyone about it. I liked Undercover Mama on facebook. I would choose a black tee. I signed up for the Undercover Mama email list.